On home ice in Toronto the host nation got off the mark courtesy of captain Sidney Crosby whose slick wraparound thrilled the partizan crowd. Matt Duchene fed Chicago Blackhawks skipper Jonathan Toews for a perfectly timed redirection for Team Canada’s second goal of the evening. Europe pulled one back four and a half minutes into the second period. Slovak Marian Hossa trying his luck down at the goal line – his shot slipping under Blackhawks teammate Corey Crawford and went in. 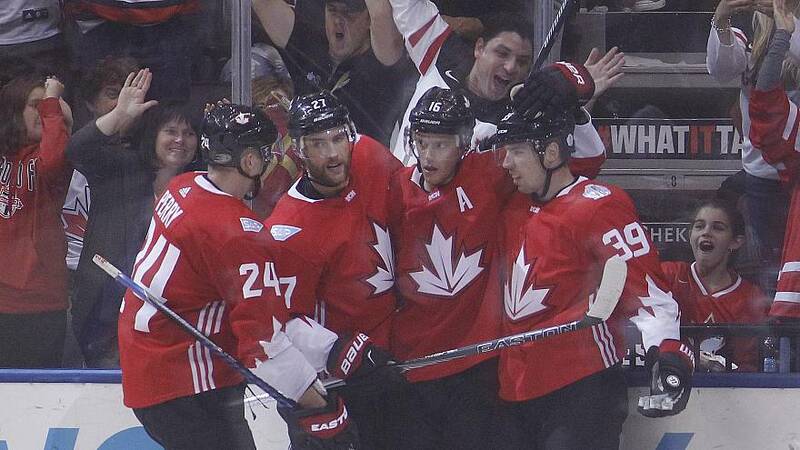 28-year old Toews, who has won three Stanley Cups, two Olympic gold medals and a World Championship – was again rewarded for a fine all round performance when he restored Canada’s two goal advantage ten minutes later. Europe defenseman Roman Josi broke his stick leaving a 2 on one play with Toews and Logan Couture on the attack – Toews eventually didn’t need his teammate and fired past Jaroslav Halak. Couture was not to be denied his name being added to the scoresheet. The San Jose Sharks winger completed the rout after slotting home a Toews set up in the third period. The 4-1 result means Canada top Group A with Team Europe heading into the semis as runners up.